A sheave is a wheel or pulley with a groove designed to fit either a belt, rope or cable. In power transmission, sheaves will most often utilize a belt. A drive utilizing a sheave (a belt and pulley system) is characterized by two or more sheaves in common to a belt. A sheave or belt drive is a method of transferring rotary motion between two shafts. 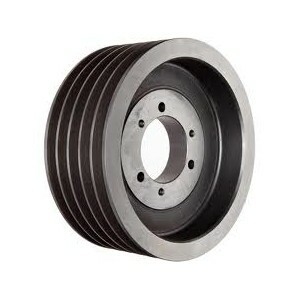 A sheave drive includes one pulley on each shaft and one or more continuous belts over the two sheaves. This allows for mechanical power, torque, and speed to be transmitted across axes and, if the sheaves are of differing diameters, this ratio creates a mechanical advantage. A sheave or pulley drive is similar to a chain or gear drive, except the ratio and speed reduction is accomplished through differing pitch diameters of the sheaves rather than by the number of teeth on a sprocket or gear. The motion of the driving pulley is, generally, transferred to the driven pulley via the friction between the belt and the pulley. Synchronous/timing belts have teeth and therefore do not depend on friction to transmit motion.